1. Write valuable content on your site. If you decide on email marketing, you most likely have a web site where you advertise your products or service. Think about what could provide value to your website visitors and turn it into the content. A good practice is to write about your experience with your products, do case studies and share your results in articles, provide good tips and tricks related to your products or services and to your niche in general. This will make your readers come back to your site and join your list. 2. Make the subscription form visible. Put the subscription form on your site. Do not hide the form from your readers but make it easy to see and find. 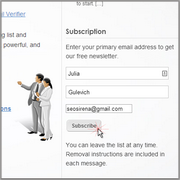 You can place the subscription form on the side bar, in the page footer or inside the post. Here you can read about how to find the best place for your signup form. If you have a WordPress site, you can download and install our WPNewsman newsletter plugin that will allow you quickly put the signup form on your site and collect subscribers uisng the double opt-in method. 3. Make the subscription process easy. Do not overload your subscription process. Keep only those fields that are necessary for your email marketing campaign. Generally, name and email are enough. But if you feel you can segment your list by frequency, or gender, or countries or whatever and send more targeted email newsletters, feel free to ask for more information from your subscribers. 4. Use the double opt-in method. To protect yourself from invalid and unwanted subscriptions, ask users to confirm their subscription. If you are prejudiced against double opt-in and think it will decrease the number of subscribers, here you can read about the most widespread myths about the confirmed opt-in method and decide yourself what is more valuable for you: quantity or quality. 5. Segment on topics of interest. If it’s applicable to your site, let people choose the topics they want to receive your newsletters on in order to ensure the relevance of your emails. You can even place multiple subscription forms and have multiple lists to create more effective email campaigns. Email marketing is a means of being in contact with your potential buyers. Unless you ask for frequency during the opt-in process, you need to find the balance between a crazy and lazy sender. It means that you should not email them every day if you have nothing of value to tell them. And you should not email them so rarely that they have time to forget about you. Generally, sending one newsletter per week is considered to be enough. Make your frequency clear to the subscribers either on the opt-in form or in the welcome message. A good idea is to offer something in exchange for their email addresses. It could be a downloadable ebook, guide, free software, coupon or whatever you can afford. Everybody loves to get something for free. 9. Design attractive email newsletters. Spend time for creating a template for your newsletters. Make it easy to understand even with the images turned off. A good idea is to insert links to your social profiles like Google+, LinkedIn, Facebook, and Twitter into your newsletters and let people join you in social networks. You can also add sharing buttons to your newsletters to let readers quickly share the content that they find interesting. Run surveys from time to time and ask your subscribers how they like your service, what they would improve or change, and what information they would like to receive from you. Often times people can give you excellent ideas on what to write about. The users’ feedbacks will also help you reveal strong and weak sides of your service. A good thing is to ask for the user’s feedback when someone unsubscribes to know what went wrong, whether it’s your fault and you should improve the relevancy, frequency or something else, or the subscriber just changed his area of interest. You just need to be patient and creative, and follow the above tips to create a responsive list of subscribers, develop a solid email marketing program, and increase your sales.